Last edited by Fozzybar; February 14th, 2006 at 07:12 PM. The creature to be designed EATS dragons, it's not a dragon! Thanx to MIKECORRIERO for the topic! ...so it can't be a dragon that eats dragons then? LOL fozzy, that's why your the moderator in here!! Last edited by Uziel; January 26th, 2006 at 01:41 PM. keep getting well, mr. foz! ps. i should have known that was a mikec idea. LOL, yeah those are the best. Back in the old days, dragons thrived. The fire breathing dinosaur descendants had spread their leathery wings all across the globe. From the heat stricken deserts to lush jungles, the most remote places as well as venturing inside the territory of men. This latest act was brought to a halt when livestock started disappearing and villages were turned into ashes. Those dragons that dared venture into the heart of the human world were soon hunted down and killed. Not even the nests and wyrmlings of the dragons were safe as they were slain during heroic expeditions of mankind. It was only a matter of time before the great dragon race was turned into a small brood of only a handful of the smartest and strongest surviving wyrms. These wyrms migrated to remote places such as swamps, islands and some of the most hardened creatures even swarmed to the arctic regions of the planet. It was a place barely suited for dragons as the food supply was low and the weather conditions harsh. As it turned out, hunger and cold, were but the least of the dragons worries. The dragons in the frozen regions were being hunted. Hunted by something far worse then humans. Those unfortunate enough were stricken from the skies and received a merciless beating from an unseen force. Their blazing hell fires proved useless against this deceptive foe. Their dagger like claws were weak against the iron hard exterior that landed blow after blow on their scaly hides. Scouting dragons tell tales of these frigid behemoths eating their kin whilst the life of the doomed still, but barely, flowed in their veins, and turning the snow a sickening red. Over time, a few of the most savage dragons learned to adapt to the climate and the chilling predators of the arctic and became frost dragons, as cool and merciless as their surroundings. Last edited by possessed; February 2nd, 2006 at 02:08 PM. Sweet topic. I'm going to go for a repto-mammal nest scavenger kind of thing. EDIT: Whoops! I didn't have enough time to work on this any more, I wish I did, it's a cool topic, you guys did some amazing things with it. I'll be sure to vote. Last edited by Orcatraz; February 1st, 2006 at 03:39 PM. I'm going to HAVE TO participate in this one and give it some tough and tender loving. Yea, I invisioned it to be something so fierce that it preys on dragons. So I would say.. that it should be anything BUT a dragon. Possessed and Orcatraz - nice WIPs!! I can't wait to see what ya'll create. I'm taking a back seat this week to watch some instructional DVDs and do some smaller studies. I hope this week's COW gets a boat load of entries! Is it a dragon eating creature with white skin or is it a creature who only eats white skinned dragons? Whee, dragons! ...Even if they are getting eaten. Vampire Bug - Although not much to look at, these little transparent creatures are the native dragon's worst enemies. The bug, which reaches a maximum of one foot in length, hides itself beneath the sands of the deserts that the dragons habitate and waits until it feels the vibrations of its prey heading toward its position. When the dragon is in range, the bug launches itself out of its shallow cave, latching itself onto the neck of the victim. It then releases a powerful electric shock that stuns the dragon long enough for the vampire to jab its pointed, hollow tongue into the jugular, where it feeds on the blue blood of the dragon until full. They are solitary hunters, but because of their size, they can't ingest all of the blood of a single dragon by themselves and are often joined by "opportunity feeders", which feed until the victim is nothing but a bloodless husk on the desert floor. Last edited by silentkitty; January 30th, 2006 at 01:39 PM. 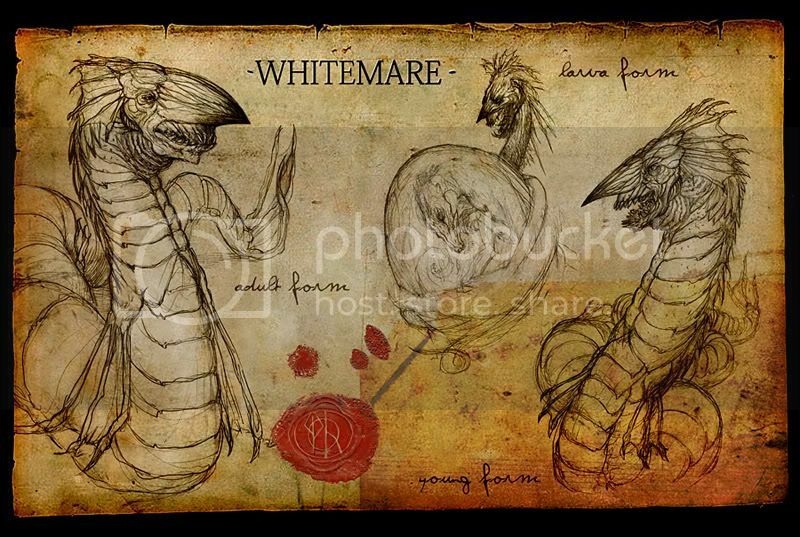 This is my WIP - WHITEMARE. Just playing with photoshop. jakkas, you made me spit my coffee on the screen and now i've got to clean it off. love the paper, love the layout, love the friggin' wax seal. you, sir, are a talented mo-fo. cannot wait to see what else you do to this. 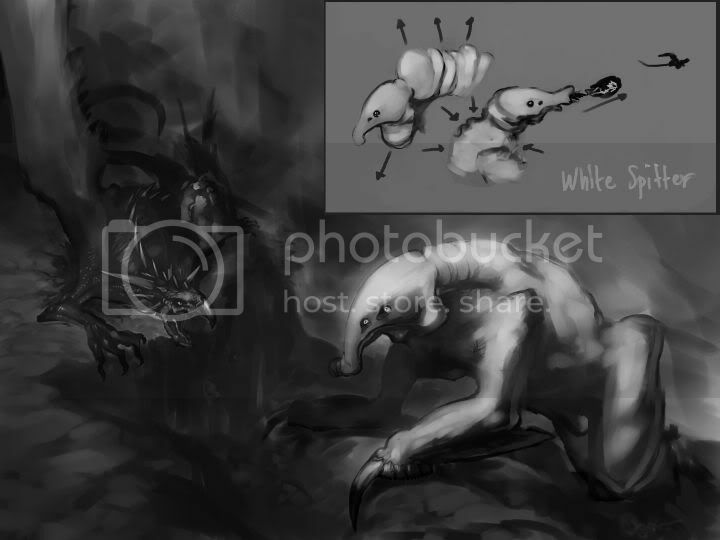 While hunting, this enormous beast expels copious amounts of steam from thermal vents, which, with its white skin, serves to disguise it as a cloud as it wanders along dragon flight paths. Sensory organs along its sides sense pressure differences in the air, telling it when a dragon is near. As potential prey enters its kill zone, the "whale" emerges from the cloud without warning, shoving its jaws forward and wide open, filling what was a vacuum in its gullet with the air in the immediate vicinity. The suction drags the hapless dragon into its throat, where it is crushed by compressing musculature. 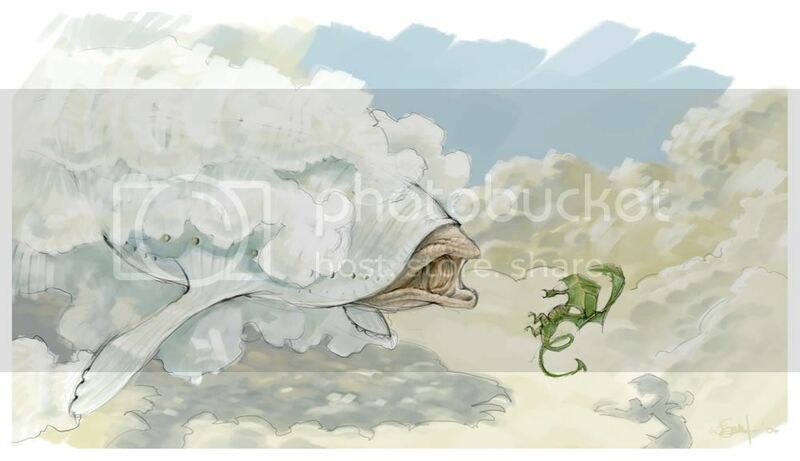 Due to the scarcity of dragons in general, the Bellows Whale has adapted to a lethargic lifestyle between hunts, taking cover in the cloud deck, conserving energy for heat generation and short bursts of speed. Last edited by Corrick; January 30th, 2006 at 05:20 PM. Possessed, that piece is great. Really nice colouring. Well thanks a lot now I have to come up with something new, way to make me think harder guys! I'm quick like that I guess. Though that doesn't mean there aren't other white skinned brutes flying around. Cognition, Silentkitty, thanks for the comments! There's nothing wrong with thinking. Last edited by Corrick; January 28th, 2006 at 01:18 AM. This monster roams the land looking for it's prey. Dragons. When one is found the White Spitter gathers air and fluid in the chambers on its back to build up a high pressure in its trunk and starts producing a resin-like substance beneath its throat. Then at the right moment the substance is pushed into the trunk and the pressure is released. Practically shooting it at the target. If it hits a wing on the dragon it will most likely fall to the ground almost helplessly. All the White Spitter has to do after that is find the spot where the dragon landed and beat it to death with its "fists". Last edited by ogar555; January 28th, 2006 at 02:59 AM. Thx redehlert. But i forgot to mention that this "paper" was found by LORD FREDRICKSON in The Egyptian Lich pyramid...hehe. SketchBook: White dragon gives you this.